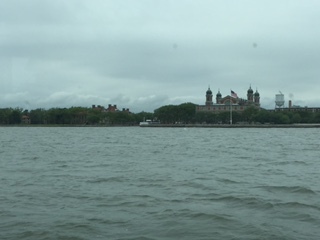 I have been reading every book in the library about Ellis Island Immigration for a new children’s book I am writing, and taking the virtual tour offered by Scholastic on the Ellis Island website over and over again to get a sense of what the Immigrants experienced. I finally decided that I just had to go back to take a real tour again. I needed to feel the magic. I wanted to be able to imagine how it must have felt to be one of the tens of thousands of people who steamed into the New York Harbor, like my grandmother and countess others of my extended relatives. So I assembled an entourage, and went on a field trip. 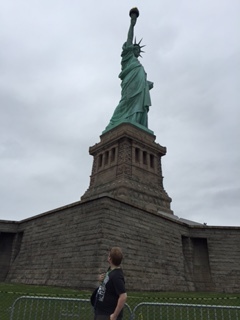 Just like the immigrants, our first view was the magnificent Statute of Liberty. She is truly majestic! And it was easy to feel the hope that the sight of her inspired in the weary travelers. But after they sailed past Miss Liberty, the steamships dropped anchor and inspectors came on board. First and second class passengers were interviewed and examined on the ship, but people who traveled steerage called the “the huddled masses” in the famous poem, were loaded onto ferries and sent over to Ellis Island. I imagine it looked very grand, but a little foreboding, to the Immigrants, apprehensive about the next hurdle in their journey to America. It was a slightly gloomy day, and the fog enshrouding the island helped me imagine the both the awe the building inspired in the hearts of the Immigrants and the apprehension. The building was made in the French Renaissance style, purposefully, to be both grand and welcoming. The theory was that some of the Immigrants would never have been allowed to enter so grand a building in their old country. The government planners wanted to both welcome and entice the hardy to make America their new home. 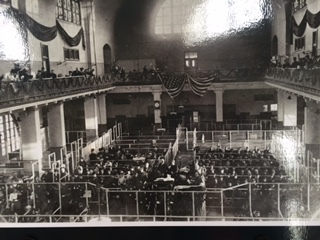 The grand hall, where most people were processed within 6 to 8 hours was stripped of its 1900s cages, and 1912 benches and was a vast open tiled area, devoid of emotion. 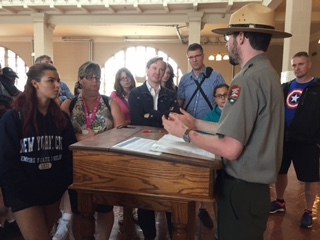 Three lone inspection desks stood before the “stairs of separation” from which the Immigrants exited the building – either to go on with their new life in America or to be sent for further examination or deported back to the old country. This sterile hall hardly captured the angst of the heyday of immigration. These people followed the rules, their fate in the hands of the civil service workers trying to implement the imperfect American immigration system. Despite trying to process thousands of people a day in as short a time possible, with all the potential for error that quick assessment brings multiplied by the lack of a common language, only 2% of the people were turned away. We heard incredible stories of kindness and assitance but also of heart wrenching disappointment. Even if it still requires a vivid imagination to get the full feel of the Ellis Island immigration experience, the stories touched my heart and I will try to retell them to preserve the wonderful glimpse into mostly the best side of our human nature. June 19, 2015 in Need-to-know.